So I lied to you.. I've decided I'm not doing the big reveal tonight. Instead I'll show you some of the 'work in progress' pics as a teaser. So.. First thing I did was rip that ugly vanity out. Here is what it looked like (since you can't really appreciate it in the before pics)sitting on the back porch. Since it sat next to the tub it was all discolored on the right hand side.. ick. Next thing I did was rip down the medicine cabinet. 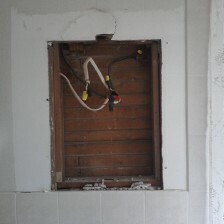 The original plan was to use the existing wiring to install a new fixture.. However when I tore down the cabinet, this is what I found. TIME TO CALL THE ELECTRICIAN! No more DIY for me. I am not an idiot. In the meantime, it was time to test out paint colors. And tape off the remainder of the room. And the winner is... Martha Stewart's Brown Alpaca from Home Depot. I want to say how much I LOVE this paint (and they didn't pay me to say that.) The color palette is right up my alley, it is low VOC, the coverage was fantastic and it was CHEAP. I can't recommend it enough. I used it for the remaining projects in my house and couldn't be happier. Anyhow.. At this point I also installed the vanity, installed the faucet, and re-hooked up the drain. 100 year old iron plumbing doesn't play nice. Lets just say it took me almost 5 trips to the home improvement store and 2 trips to a plumbing supply wholesaler to get it done.. but I did. I also needed to deal with the nasty tile, which now looked pink with the coffee colored walls. The re-glazing process (where they etch and basically paint your tile) was the last step. The color of this pic is off since I was using fluorescent lights to test the fixture! Did anyone lose a limb?